Butter This Biscuit! Butter This Biscuit! I just finished desperately googling the following phrase, “Why won’t my toddler eat anything new?” This was prompted by an unfortunate event that happened earlier: My child refused to eat biscuits this morning. Yes, you heard me right. Refused to eat them. See? Don’t let his cute looks fool you– he’s totally planning his biscuit revolt in the next photo. Back to the biscuits. 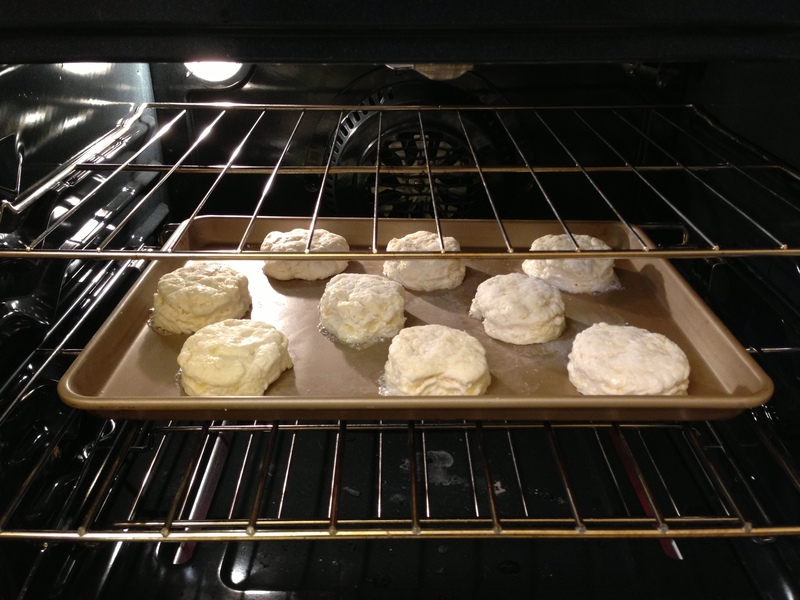 Many of you already know that my favorite biscuits are my Mama’s and my Ina’s (as in Barefoot Contessa). I’ve written about both of them plenty of times before. 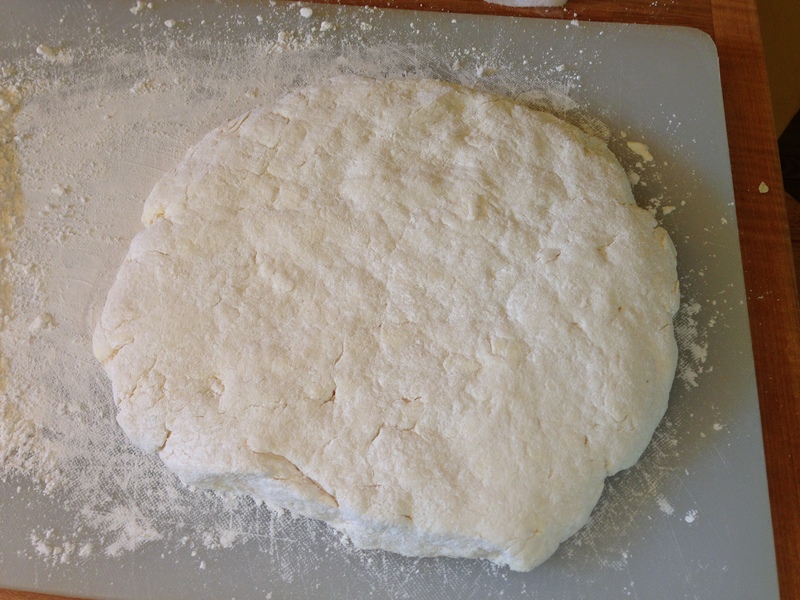 I decided to go out on a limb and try two NEW things this morning: 1) I made a new biscuit recipe courtesy of Smitten Kitchen. 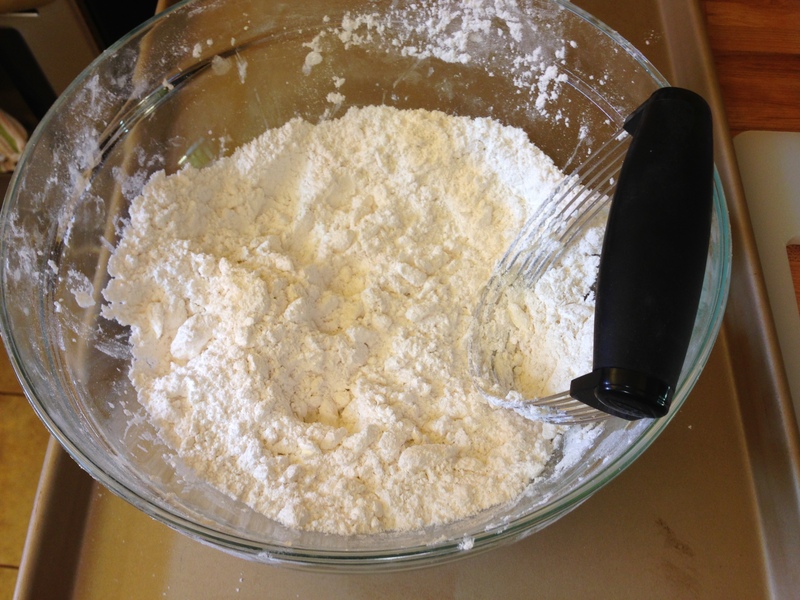 2) I used a dough blender for the first time in my entire life. I’m for real. Both decisions were good ones. The recipe was super easy and delicious and the dough blender made my life much easier because there were no paddles and extra bowls to clean after the mixing. 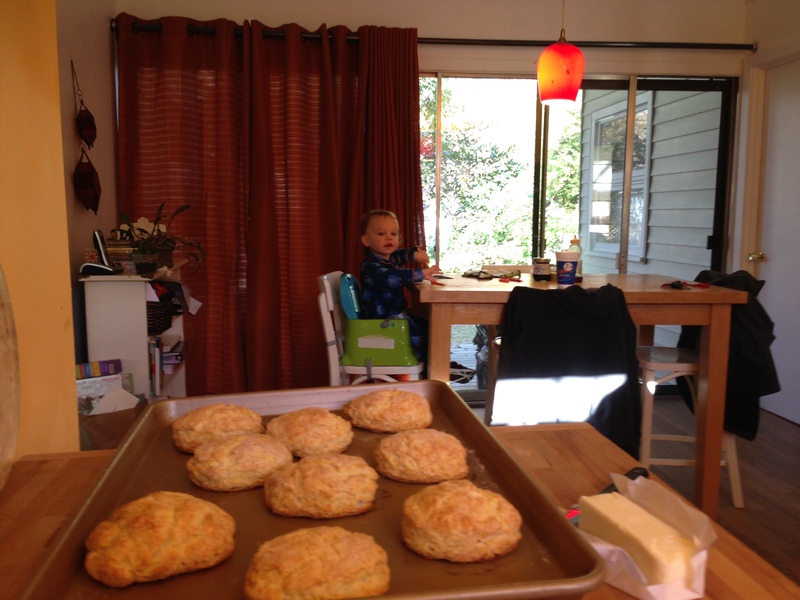 The biscuits took me all of 30 minutes (max) and that included the 15 minutes they were in the oven. Because I stuck so closely to the original recipe, I will just send you over to Smitten Kitchen’s website. But, first let me give you a tidbit of advice: No need to add the sugar. I say this only because I have no idea why anyone would want a sweet biscuit. Apologies to you and yours if that’s the way you roll. I’m just saying that if I added sugar to a biscuit, my Mama might just commit me. Look at that dough blender getting to work. I love that thing! And here’s the buttermilk river running through that flour/butter mixture. Deliciousness. 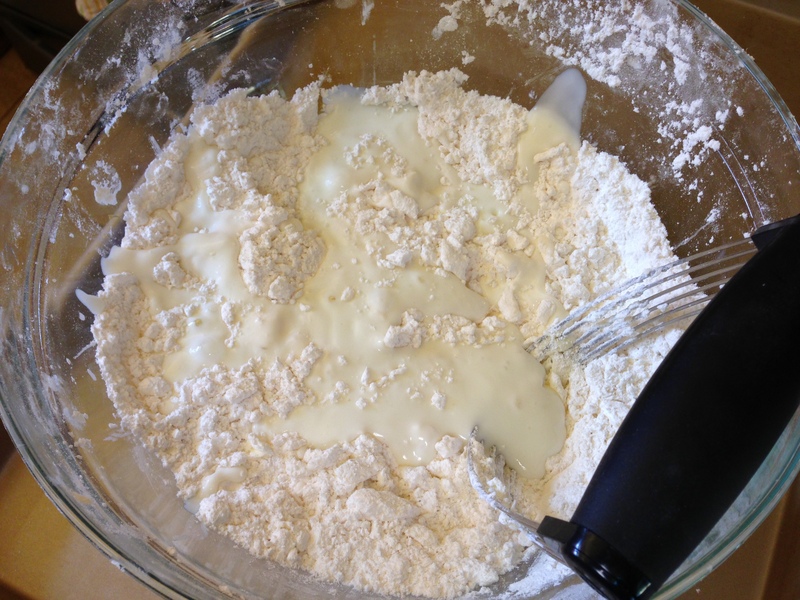 Turn it out on a surface dusted with flour. I never knead my dough. I pretty much pat it until it sticks together. 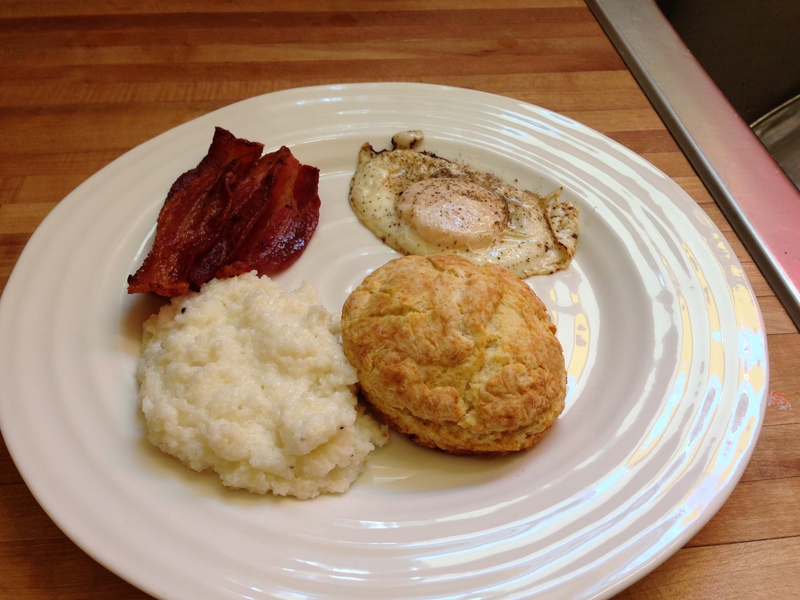 Once they were finished, I decided they needed to get to know some (thick) grits, bacon, and a fried egg (over-easy). What? I *had* to use the bacon because it was left over from a recipe I made for Thanksgiving. It also occurred to me while eating these hot, flaky, buttered biscuits that I’m supposed to get in a bathing suit next week to celebrate one of my dearest friend’s destination wedding. Between the Thanksgiving cornbread dressing and these biscuits, I’m pretty sure “doughy” is where I’m headed in the bathing suit department.